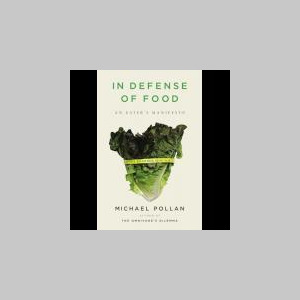 Michael Pollan is the author, most recently, of In Defense of Food: An Eater's Manifesto. His previous book, The Omnivore’s Dilemma: A Natural History of Four Meals (2006), was named one of the ten best books of 2006 by the New York Times and the Washington Post. It also won the California Book Award, the Northern California Book Award, the James Beard Award for best food writing, and was a finalist for the National Book Critics Circle Award. He is also the author of The Botany of Desire: A Plant’s-Eye View of the World (2001); A Place of My Own (1997); and Second Nature (1991). A contributing writer to the New York Times Magazine, Pollan is the recipient of numerous journalistic awards, including the James Beard Award for best magazine series in 2003 and the Reuters-I.U.C.N. 2000 Global Award for Environmental Journalism. Pollan served for many years as executive editor of Harper’s Magazine and is now the Knight Professor of Science and Environmental Journalism at UC Berkeley. His articles have been anthologized in Best American Science Writing (2004); Best American Essays (1990 and 2003) and the Norton Book of Nature Writing. He lives in the Bay Area with his wife, the painter Judith Belzer, and their son, Isaac. To contact him, email: inquiries@michaelpollan.com.